ProStyle Knee Wraps are designed to give you the comfort of an elastic support with the therapeutic properties of heat, without the perspiration associated with neoprene. 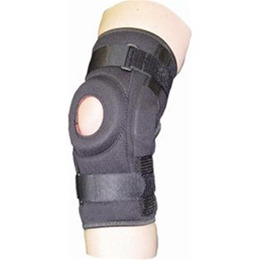 These supports are ideal for knee sprain or strain. Features Include: Wrap design allows for an easy fit. ProStyle retains heat to help keep muscle loose. Offers treatment for ACL, LCL, MCL, PCL sprains. Recommended for swollen or tender knees resulting from: sprains, strains, sports injuries or post-operative rehab. Offers treatment for Osgood-Schlatter Disease as well as patellar instability.